Note: article updated 24.05.16 to include missing words/corrections to misreadings - thanks to Simon Marsh and Ivor Carr. I recently came into the possession of a document written in the 1660s. It appears to be a letter awarding a pension to a solider who had served in the English Civil War. It is dated 17th August 1661. The document measures roughly 20cm x 12 cm, though a small (presumably blank) portion of the top-left corner is missing. 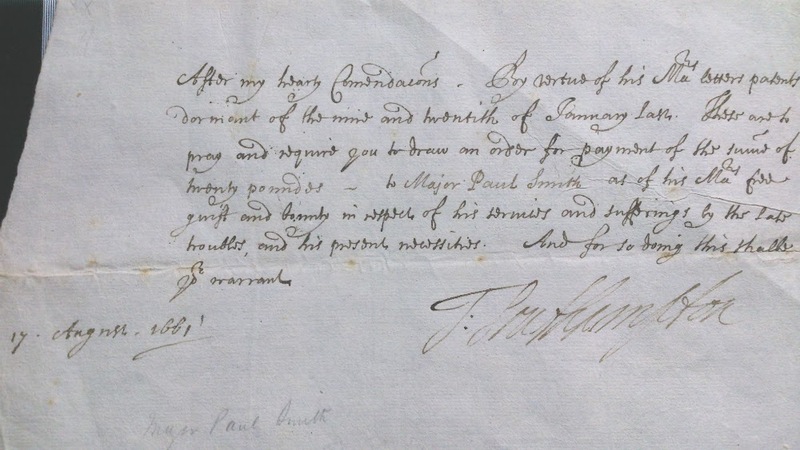 The document is signed by Thomas Wriothesley, 4th Earl of Southampton, and the signature/handwriting appears to be the same as on other documents bearing his hand (a number can be found online, eg here). Wriothesley initially sided with Parliament on outbreak of the Civil War, before supporting the king and seeing his fortunes rise after the Restoration. On 8 September 1660 he was appointed Lord High Treasurer, a job that he would hold until his death, meaning that he would have signed this document while holding this post. The signature of the 4th Earl of Southampton. From where was it sent? As mentioned, the dating of the document seems to indicate that it was written while Southampton held the position of Lord High Treasurer. The letter may therefore have been sent from Whitehall, or from one of the Earl's other residences, including Place House in Titchfield, Hampshire (see my previous article on Titchfield). There is no salutation at the top of the document, though its contents appears to suggest that it is written for Major Paul Smith himself. As it is written in the third-person it could, however, have been addressed to another individual drawing the pension on Major Smith's behalf, or simply be a legal document unintended for Major Smith's eyes. "By virtue of his Majesty's letters patents"
What does it pertain to? The award of money to Major Paul Smith is for his service during a conflict that took place prior to 1661, presumably the English/British Civil Wars. The name is repeated in pencil at the bottom, possibly added more recently, though the handwriting appears similar. The document mentions that the recipient of the award is being compensated for his 'sufferings by the late troubles', suggesting injury or disability perhaps caused by fighting in the conflict. Do we know anything else about Major Paul Smith? 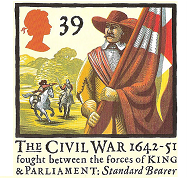 A Major Paul Smith (or Smyth) served in Lord Wilmot's Regiment of Horse at the Battle of Roundway Down in 1643, and his individual actions are documented. Smith led a forlorn hope of 300 men at the commencement of the fighting that drove their Parliamentarian opposite numbers back into Waller's horse. Seeing the confusion Wilmot's men charged into Sir Arthur Hesilrig's Lobsters, routing them in what would become a decisive Royalist victory. The same Major Paul Smith is also documented as riding with Prince Rupert's Lifeguard at the First Battle of Newbury a few months later, and his name (again as an officer in Wilmot's horse) is listed in the Edgehill order of battle. Could the recipient of the £20 be the same man that charged the enemy at Roundway Down? Did he suffer injury there or in subsequent campaigns that, on retirement, would leave him needing a handout from the government? Pension rolls and other lists of Royalist officers awarded pensions for their service in the English Civil War exist, though I have yet to find the same Major Paul Smith listed. What else is interesting about it? Closer examination may suggest that the letter was not written by one hand or at one sitting. Though the handwriting is similar, enhancing its colour contrast reveals that the salient information - the amount of the award and to whom it is to be awarded - is written lighter ink. This may indicate that the document was prepared as a pro-forma, with the 'twenty pounds' and 'Major Paul Smith' added later, possibly by Southampton himself. The sum and the recipient enhanced. Were they written by a different hand? 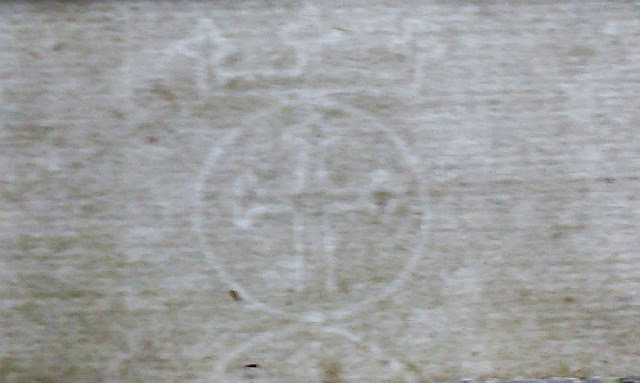 The digitally enhanced image shows a cross with a crown above, possibly indicating a government office, though I have been unable to find an exact match in lists of 17th century watermarks and seals. If anyone can shed further light on this, or the document as a whole, please get in touch. Half-way house: The Stuarts at Titchfield - previous article about Titchfield Abbey, the Stuart monarchy and the Wriothesleys. Cheers Ivor - really helpful. Will update the article shortly. Banbury was relieved by Northampton's Brigade which consisted of his own, Lord Wilmot's and the Earl of Brentford's and as you know Smith served in Wilmot's. His wounding is mentioned in Heaths Chronicle P 63. He is listed under Wilmot as an Indigent Officer SP29 68 ERD/7741 column 143. Although listed as Lt. Colonel it is common in the List for people to "bump up" their rank or it may refer to a later promotion. He received a warrant for £120 (a not inconsiderable sum) as Royal Bounty 13th January 1664-65 (Calendar of Treasury Books, Vol 1 1660-67 p.645). He became Lieutenant in the Duke of Richmond's troop and regiment of "Select Militia" 2nd July 1666 (Dalton Vol.1 p. 61). Thanks Stephen - this is fantastic. Are any of the sources you mention freely available online?